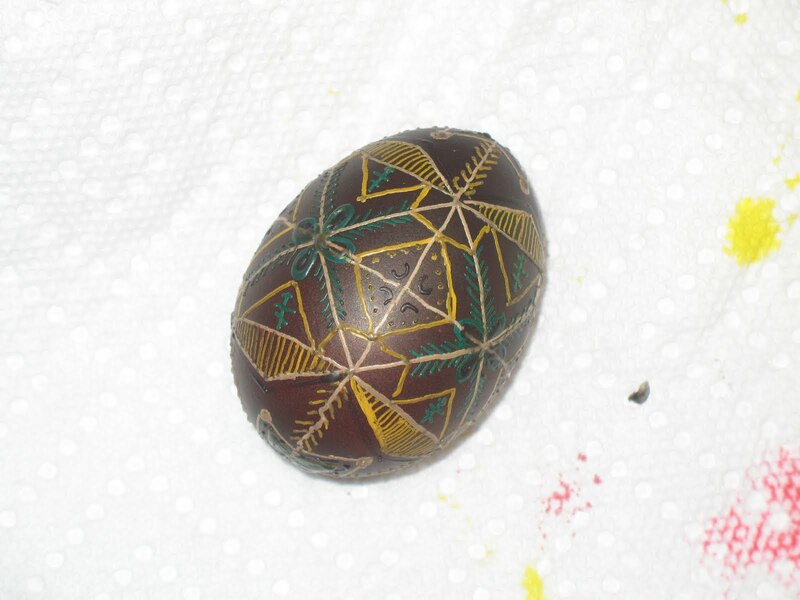 After the not-so-successful venture with natural dyes, I allowed the children to use the pysanky dye I had just received from Mom. I was going to do it anyway, but hadn’t planned on the children using it. It’s rather potent. Here are a few of their eggs. 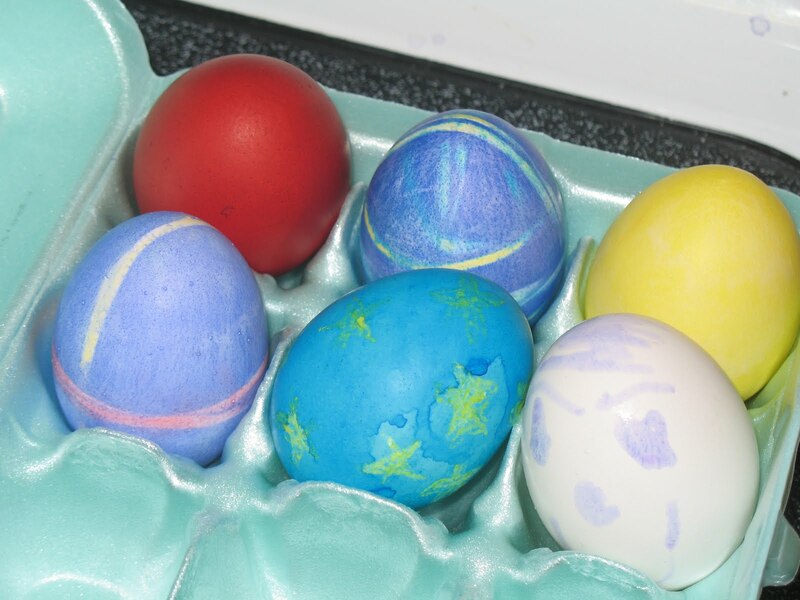 The trick to dying perfectly red eggs is to use brown eggs. White ones will tend to turn pinkish. I’d never done pysanky before and it seemed miserably hard. But Mom sent the kit and I figured it would be fun failing anyhow. I’d left several eggs out all day so they’d be room temperature. The little blue and red-handled tools are called kistka. It’s essentially a stick with a little metal cup/funnel at the end. A small amount of beeswax (never paraffin) is placed in the cup part and it is held over a candle flame. 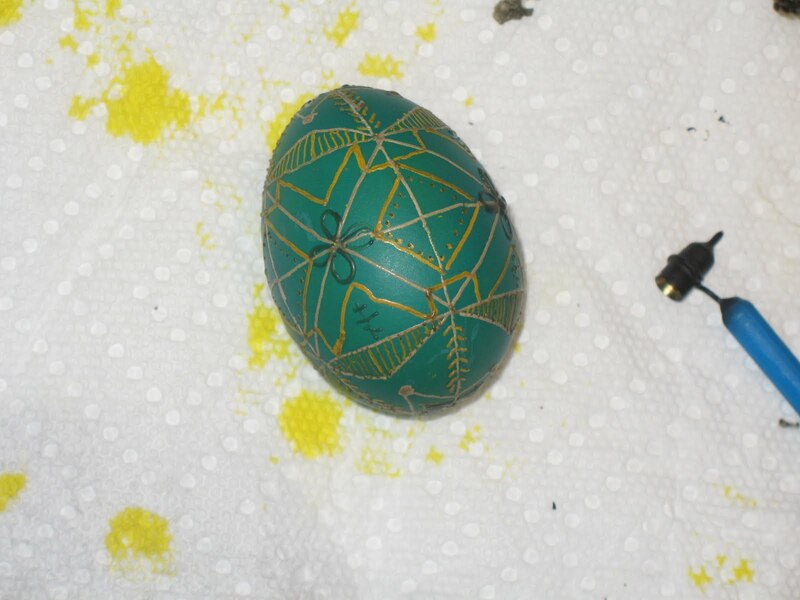 When the tip of the kistka is placed perpendicular to the egg surface, liquid wax comes out by capillary action. Rather like writing with a quill. 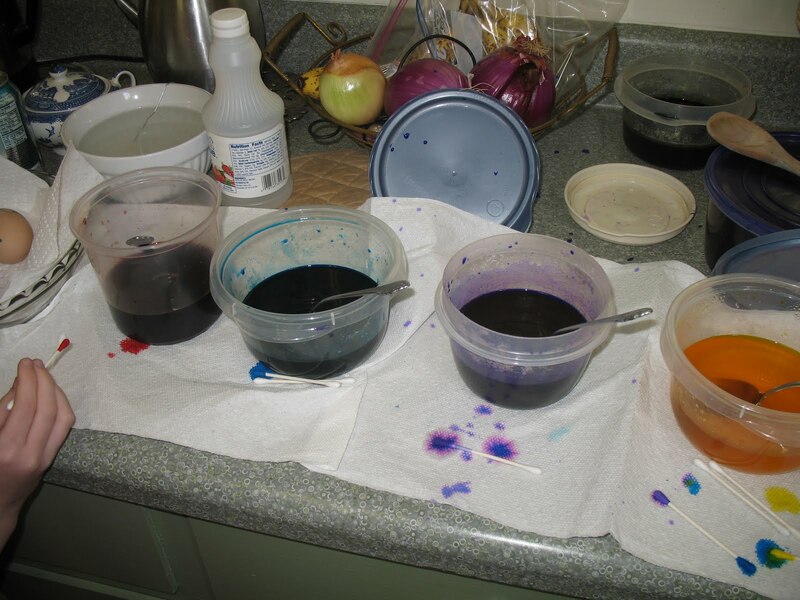 The wax tends to be blackish because of the candle soot. This is helpful because you can see it better on the egg. 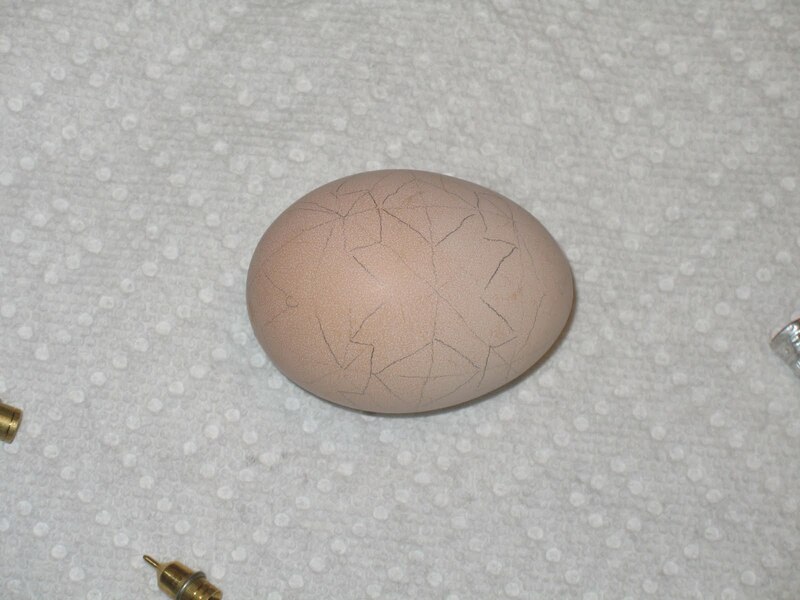 But first you have to draw a pattern on the egg. Well, you don’t have to but I didn’t trust my freehand. 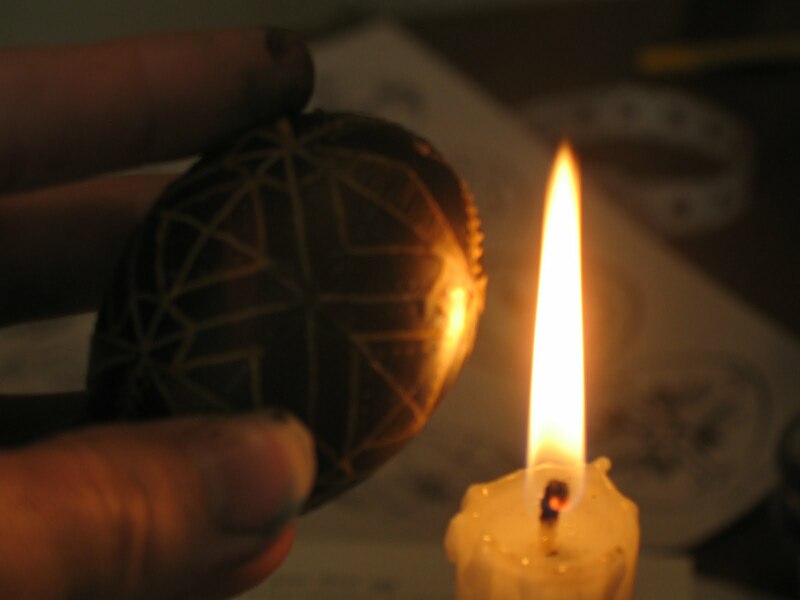 Then you just start putting wax wherever you want the original color of the egg to show through. This can be a little or a lot. After that, you put the egg in the first color. You tend to do lightest to darkest, but actually I’ve read that you can do pretty much whatever you want and the results are surprising. However, I wasn’t looking to be surprised. After you’ve dried it off the last time, it looks pretty messy, mostly covered with blackened wax. Now you take the wax off. There are several methods to this, but I chose the most simple and frankly, probably the most gratifying. 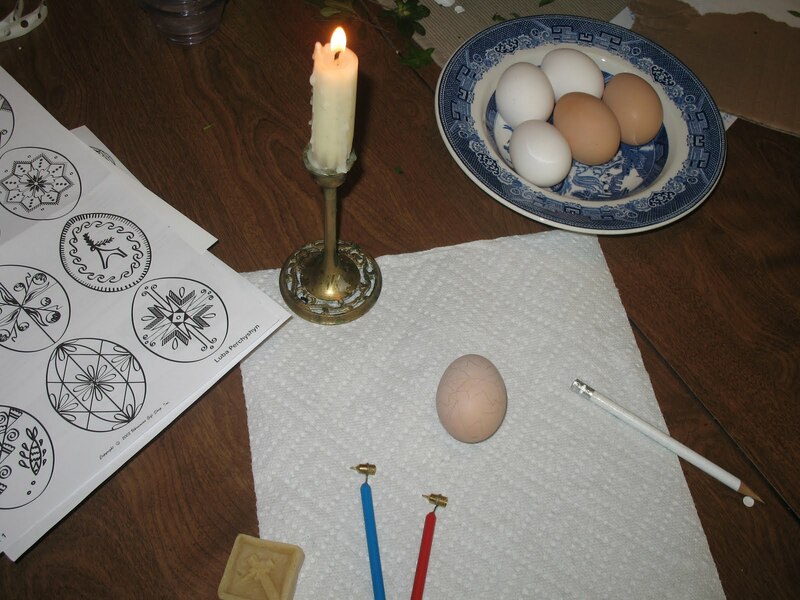 You hold the egg in the side of the flame, moving it back and forth a little (if you let it stay in one spot too long, you’ll cook the egg or explode it – neither one advised). As the wax melts, you wipe it off from time to time with a clean paper towel. When the wax was all off, I was amazed. Frankly it was hard to believe I’d made the exquisite little creation in my hand. You’re supposed to cover it with polyurethane at this point, but I substituted olive oil. This adds shine and protects the surface. Interestingly, you actually don’t have to blow the eggs. They naturally dry out through the shell if kept in a well-ventilated place and turned occasionally. I eventually blew this one because I intended it for a gift and didn’t feel like I wanted to include instructions for keeping/turning it. I did another egg the next day. Both of them turned into Pascha gifts. I’ll show them in another post. 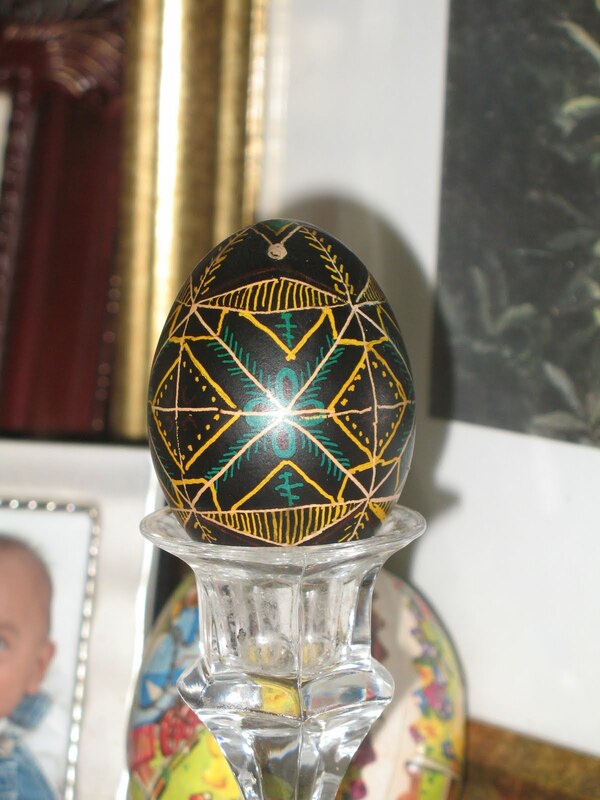 Great site, pysanky is something that was handed down to me through my mother and I now teach it to my grandchildren. Thanks for sharing.